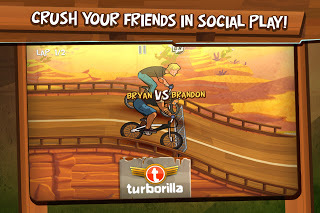 Two games enter, one game leaves; or takes home the checkered flag; or gets your download or something like that..
Turborilla has just released a new entry to their ‘Mad Skills’ line up with ‘Mad Skills BMX’. In playing this awesome new kid on the block racer, I couldn’t help but compare with their previously released ‘Mad Skills Motocross’ title, and thought I would size them up against one another. To be honest, I am not going to pick a ‘winner’ out of the two; just provide some similarities and differences, and pros/cons between the two as they are both two of my favorite games on my iPad and iPhone, as this genre has always been one to pique my interest out of all the craziness of titles that make up the AppStore. Let’s get the big one out of the way, the controls. Mad Skills MotoX provided buttons for throttle/brakes, an un-realistic ‘jump’ button (one of which, I almost never used and still faired quite well on each Division), and most importantly, buttons for lean. There were also options in MotoX for Tilt to lean, and configurable throttle button locations (left/right) and a exclusive option to move the entire control scheme to the center. 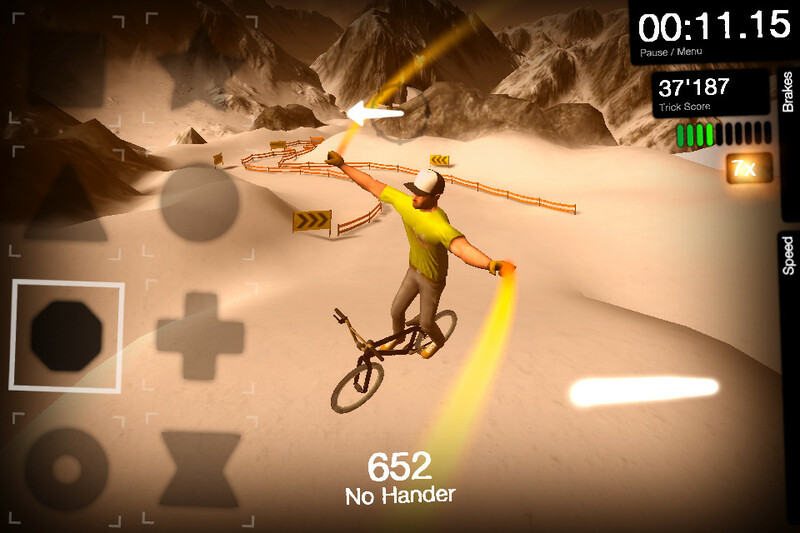 In BMX, you still have the option to move the pedaling from either the right/left side. The first thing I noticed was the ‘Tilt to Lean’ on/off radio buttons. When off, I guess I’m kinda ‘slow’ to pick it up, but the tilting was done by swiping in the direction you wanted to tilt. This was quite difficult to master, but by the time I was mid-way through the ‘Intermediate’ division, I had it nailed. You just have to swipe gently/forcefully to get the lean desired. BMX does not have buttons for anything as it is entirely swiping. My first thought was, well, I didn’t get it, considering how masterful their previous buttons worked on MotoX. 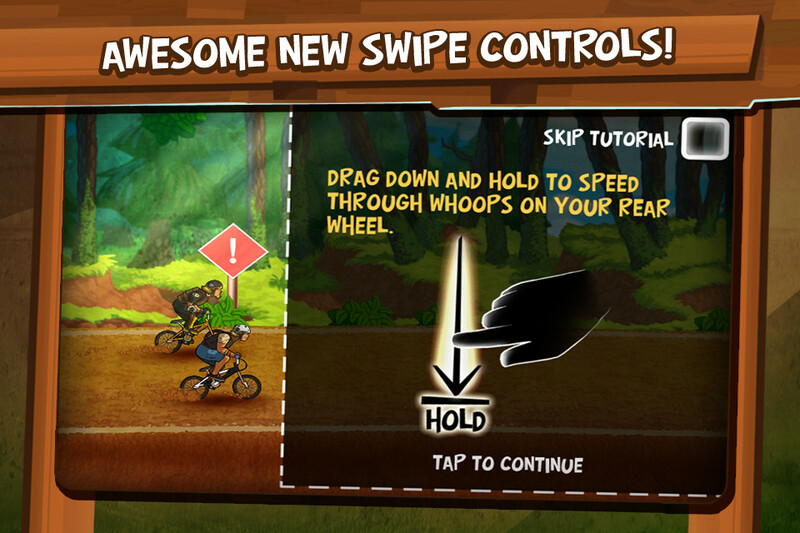 The more I played with BMX’s swiping method, the more it jived, and it works…awesome. The key is to not only swipe for the intended outcome, but hold your finger on the screen at the end of the swipe. You swipe down to gain speed on downslopes and to crank wheelies through whoops, swipe up to jump, and contrastingly down to come down quick once airborne. One essential thing for me was to really utilize that down swipe to gain speed on whoops and downslopes. 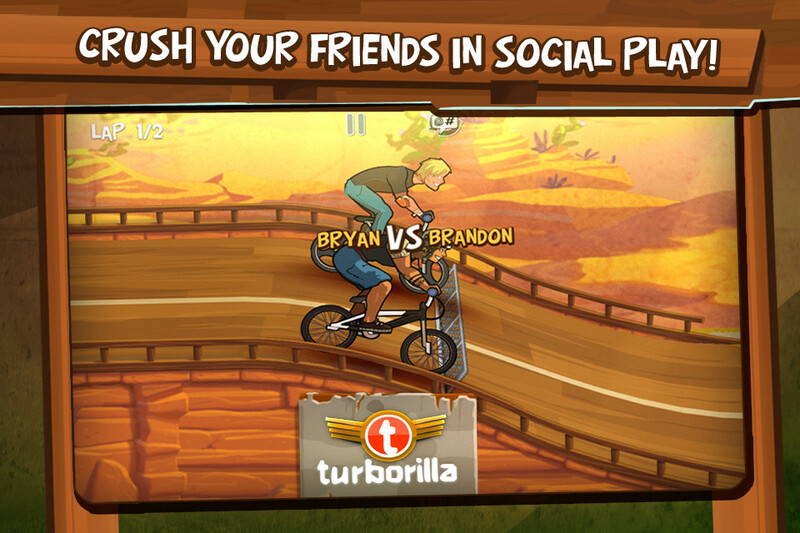 Both games allow you to throwdown back/front flips, but with BMX, you do so by swiping sideways as opposed to hitting the lean buttons on MotoX. 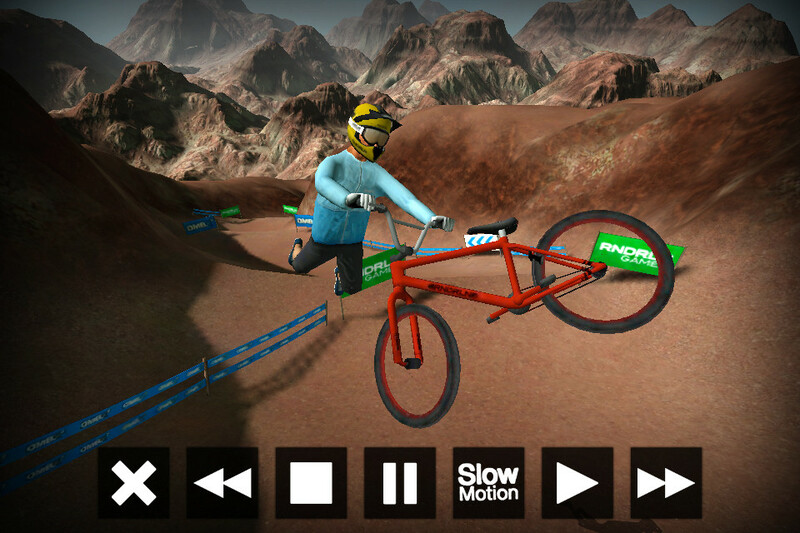 Both BMX and MotoX have very different control schemes, and for their respective games, work perfect. 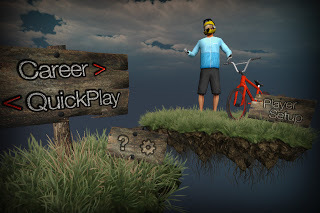 BMX puts you on one of the bevy to choose from bmx bikes and has you pedaling and flipping through some of the more spot on physics I have come across on the genre. The realism is out of this world and the retina graphics support that feel as they are as lush and gorgeous as they come. 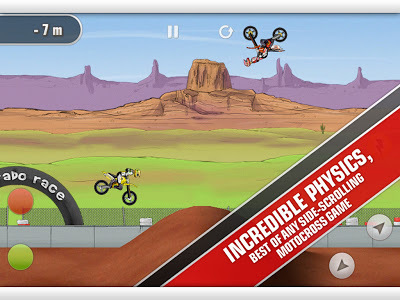 Mad Skills MotoX has seen its share of updates, thankfully, and the graphics are not quite as gorgeous as found in BMX, but they are still top notch. When considering wipeouts, MotoX provides ragdoll crunching animations, where in BMX, the riders are a little more stiff. 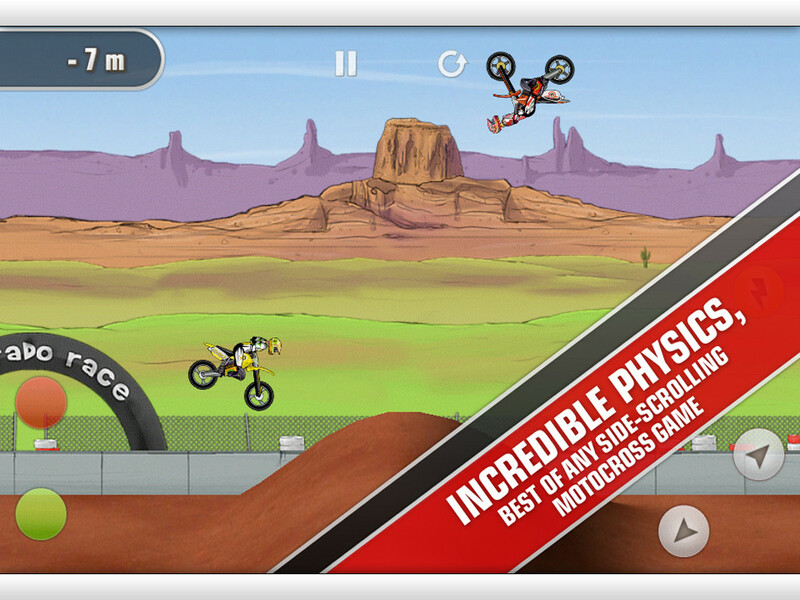 I see the BMX animations as being more realistic, but the MotoX crashes are probably more fun to admire. Turborilla has perfected the ability to allow you to get good with their game progressively, and the difficulty curve is among the best I have seen in any games. In MotoX, there are five(5) divisions, with Division 5 being the easiest. 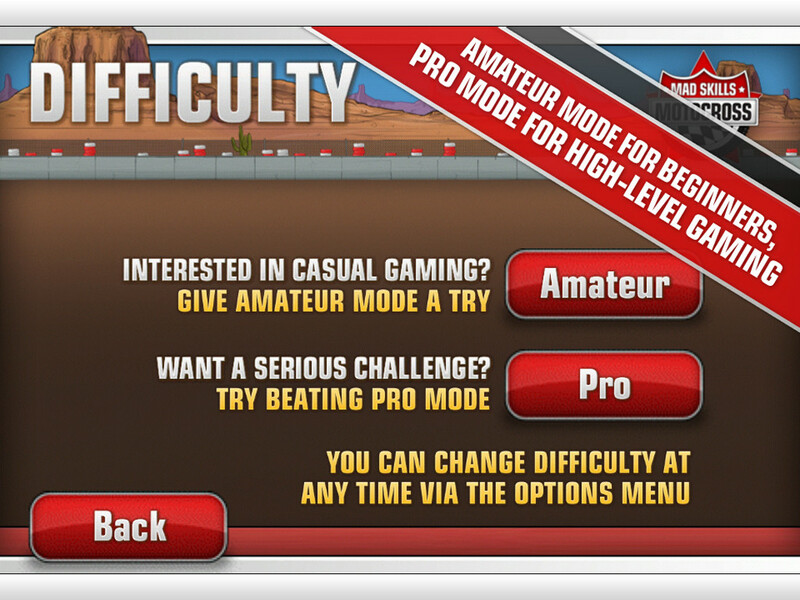 The welcomed option found in MotoX is that they included both an ‘Amateur’ and ‘Pro’ difficulty settings, for all divisions, with the former designed for casual players, and the Pro settings for a little more challenge. In MotoX, your competitor could always be seen taking a nasty wipeout allowing you to crank past them with ease and take home the checkered flag. Not so in BMX. The Difficulty in BMX is stiff. Not overly stiff. This time, Turborilla labeled their divisions more accordingly with the first division titled ‘Novice’ and the last being ‘Pro’. 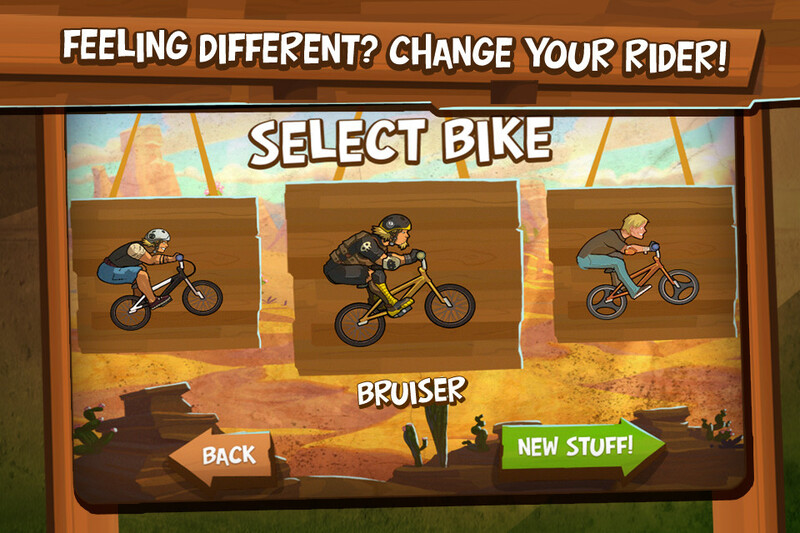 BMX however, does not include the option as found in MotoX, for amateur or PRO. This had me replaying some tracks several times over, as to progress to the next Division, you have to take at least 4 wins in your current division. 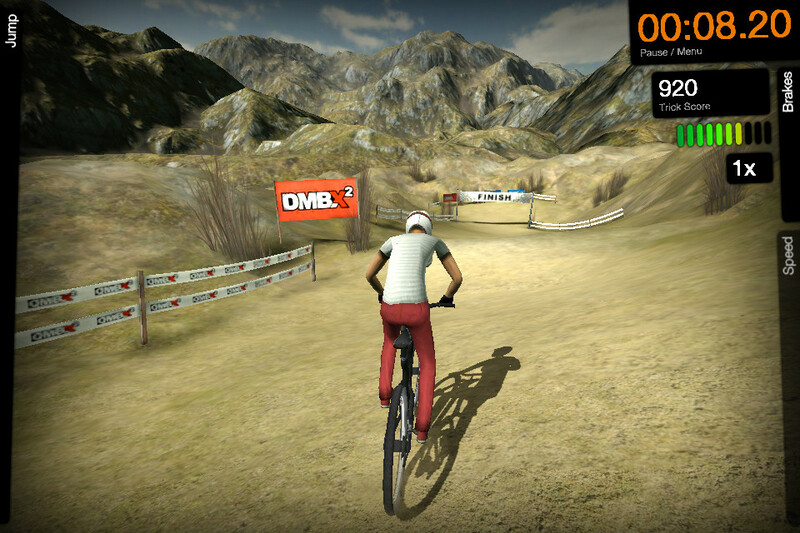 Another thing to note is that in MotoX, a separate ‘Time attack’ mode exists allowing you to race your previous time, and also includes a ‘Replay’ option in this mode so you can watch your race. Both games also include the Reset button at the top of the screen, which immediately sends you back to the starting gate. The tracks in both BMX and MotoX are superb, and ramp up in perfect correlation with your current division and stage/level in the division. The Tracks seemed longer in MotoX than in BMX, and even appear to take longer to complete, but maybe that is because that is true to life. BMX tracks are not long whereas MotoX tracks are the opposite. The obstacles you encounter are sick, and only getting more badass as you progress. What I found best about BMX’s tracks was that there was not one perfect sequence to crank out through the jumps, as in MotoX I was typically hitting the same jumps or rolling over them similarly as I did on the first lap. BMX gave me more freedom to decide what I wanted to roll over, and what I wanted to huck off. 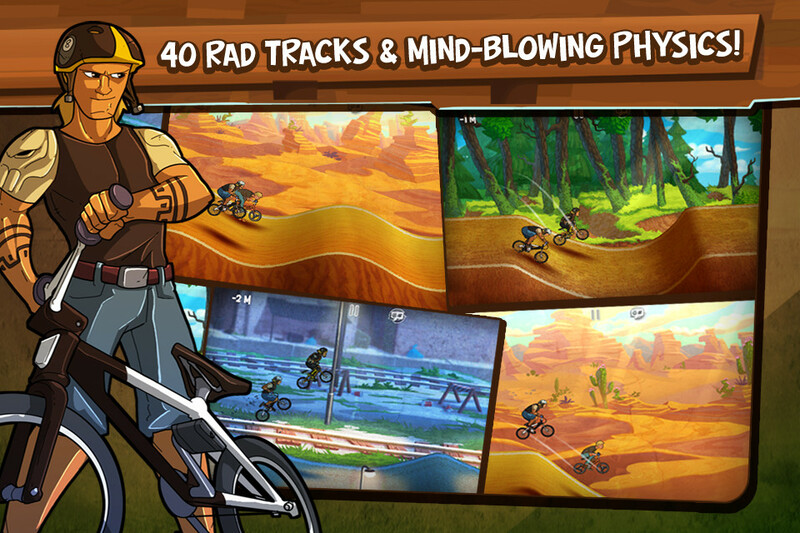 BMX comes with 40 tracks, with no options (currently of course) to purchase additional ones, whereas MotoX currently has 52 tracks in the game, 20+ free downloadable tracks, and a lot of purchase-able really cool and funky tracks as well, that are well worth the extra .99cents to unlock. One thing I immediately noticed was that in MotoX your point of view/camera angle is a lot further out than as found in BMX, allowing you to see what’s coming up a lot easier than in BMX as in BMX the camera is slightly more zoomed in. Turborilla does a fantastic job in providing us with cool bikes to choose from, even if we have to pay for some of them. 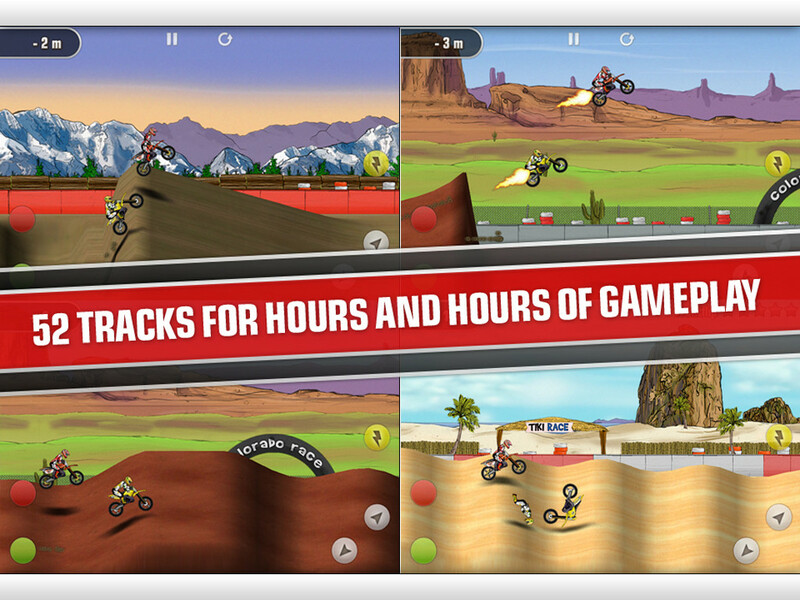 MotoX has 28 bikes, with 6 of them to choose for free, and the rest unlockable at .99cents each. BMX has 10 bikes, with 5 of them to choose for free. One of the funniest out of both games, was ‘The Hound’ in BMX which looks like a dude in a Dog suit with an overgrown head. Too funny. Weighing all the things I noted, do yourself a favor; if you don’t have MotoX yet, just buy them both! They play differently enough that you will be entertained by either for quite some time. 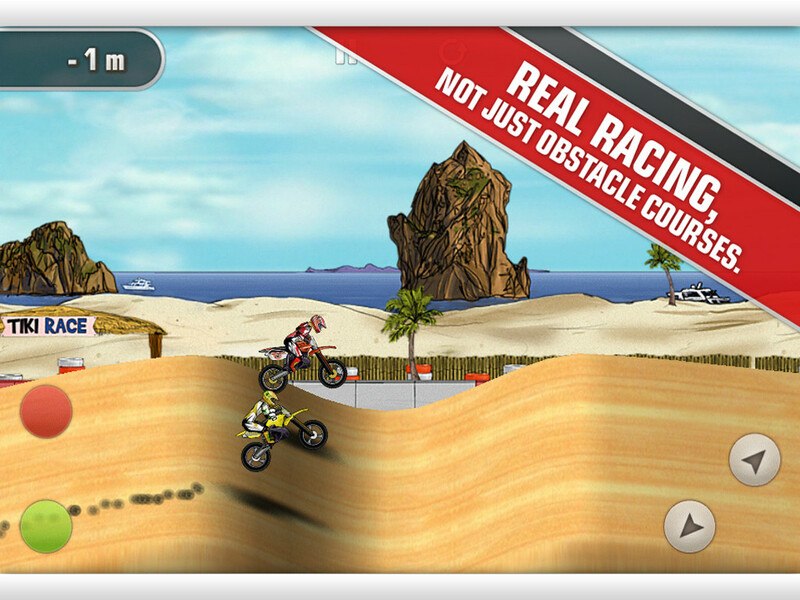 I have had Mad Skill Motocross on both my devices since its release as it is just mad fun, and I know without question that BMX will remain as well. Check out this Hilariously original Mad Skills BMX trailer below. 3…2…1…Crank!! Oh man, those were the days. 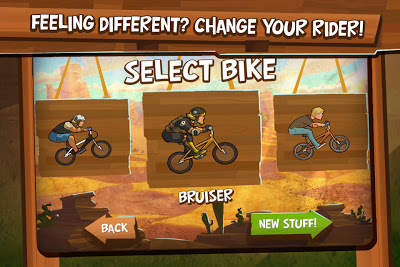 Growing up on both bmx and motocross 2-wheeled madness, when I saw the new DMBX2 hit the AppStore I was probably one of the first to hit the buy/install button. This is the second installment by Randerline gmbh and a very worthy upgrade. 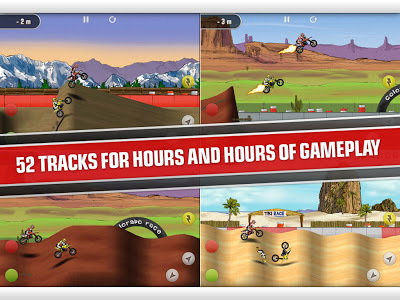 ‘DMBX2 Mountain Bike and BMX’ is a Universal, iCloud supported downhill racing game that has a equally entertaining trick challenge aspect as well. The graphics are gorgeous, the sense of speed is pretty good, and the crash animations are comical to behold (once you get past the fact you just wiped out of course) as they are spot on with your rider curling up in a ball as opposed to the typical ragdoll. The racing animations, and opponents expressions (i.e. the winner raising their hands as they cross finish line) are agreeable as well. 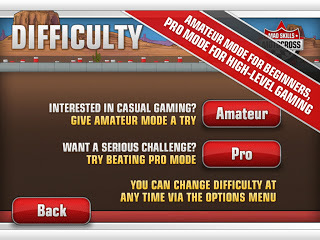 The contest comes with 3 types of challenges; time, race, and tricks. Each level also includes a training option as well, allowing you to pre-run the track, which is something that is true to life and a nice addition. The time challenges are just that, you against the clock. The races are pretty hectic with you taking your starting positions with a strong line-up, men and women, and all gunning it for the checkered flag after the proverbial countdown. The last type of adventure is the trick challenge. A variety of tricks are included, from the pretty commonly simple no-hander, to the sick ‘superman’. 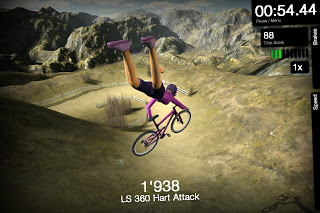 The best part is that you can throw these moves out during the races and time challenges; when you are hovering in the air on a time challenge, even though it is all about time, it was pretty easy to throw out a slick move as immediately upon leaving earth the trick button set appears. The trick combos that you can put together are pretty awesome. Beating one type of challenge in a level will unlock the next level/stage. DMBX2 includes 3 ‘worlds’; Highlands, Canyons, and the Mountains. The cool part is that these are not unlocked in a specific order allowing the rider to access any area as they desire. Each world has 4 levels, and each level contains all challenges. Add that up, and it is a somewhat limited 12 levels, but the replayability comes in beating your time and bettering your last point scores. 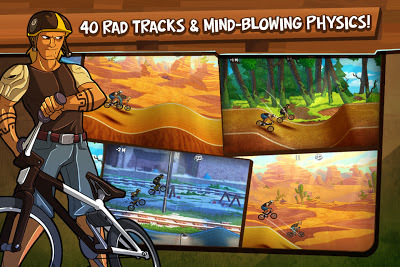 The tracks definitely get more badass as you progress as the jumps get slammer, corners tighter, and the racers more aggressive. There is also a replay option, with a highly navigable interface, providing the speedster with the options to check out that sick trick you just barely and luckily landed. Another worthy extension is the ability to listen to your own playlist as you compete. The interface is hit or miss depending on your platform. On the iPhone, tilt steering prevails, and you only need to depress the right side of the screen to crank, with the left side trick popup’s. I enjoyed my time with this title on the iPhone, but I originally bought this game with the intention of playing it on the iPad. The same tilt steering options are included for the iPad, but there is also a fixed and floating joystick selection. Here’s the problem with either; The fixed joystick find it’s center in the far upper right of the screen, right under the time and trick displays. Quite odd. This would be the best option for the iPad if it weren’t so strangely placed. That leaves you with the next option, the floating joystick. Once again, it’s center is meant to be in the upper right as that is where it immediately appears, but you can depress the lower right (seems most natural placement for me) and the joystick will work there. 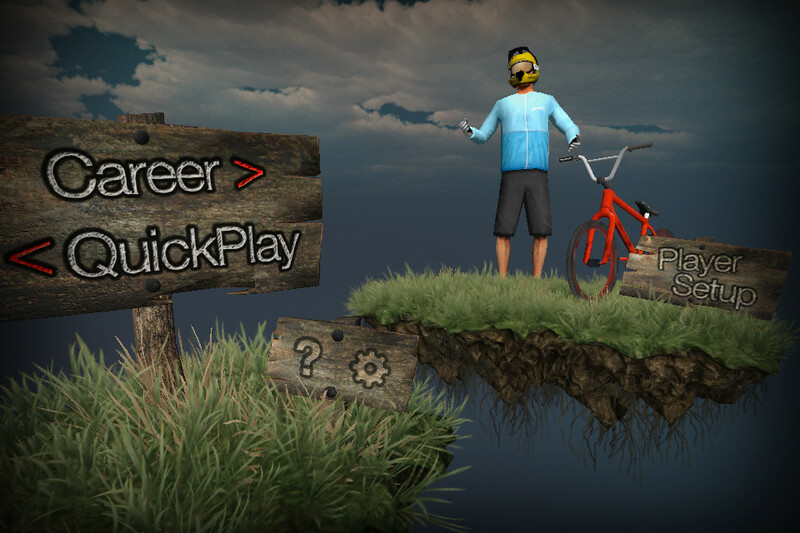 The issue with this is that once you huck off a jump, you then need to start to re-pedal and that requires the user to take their thumb off of the screen, depress again, and then push forward. When you are in a race, milliseconds matter, so once again, this is not the best option. Keep in mind that this joystick also controls your steering. So, this is why I found myself enjoying this title on the iphone much more and was disappointed with the control scheme on the intentionally bought to be played on iPad. 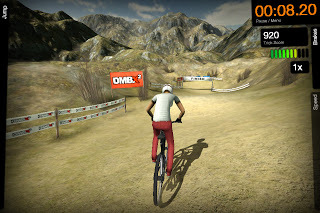 If you are looking for a downhill mountain bike racing game with gorgeous graphics, sickbird tricks, and realistic animations, you may find what you are looking for in DMBX 2. If you plan to play on an iPhone, all the better, but if you plan to play on an iPad and are opposed to tilt, you may find yourself frustrated with the current control schemes. Hopefully, the developer will fix this thorn and players on all devices can enjoy this entertaining Downhill mounting biking and BMX diversion. 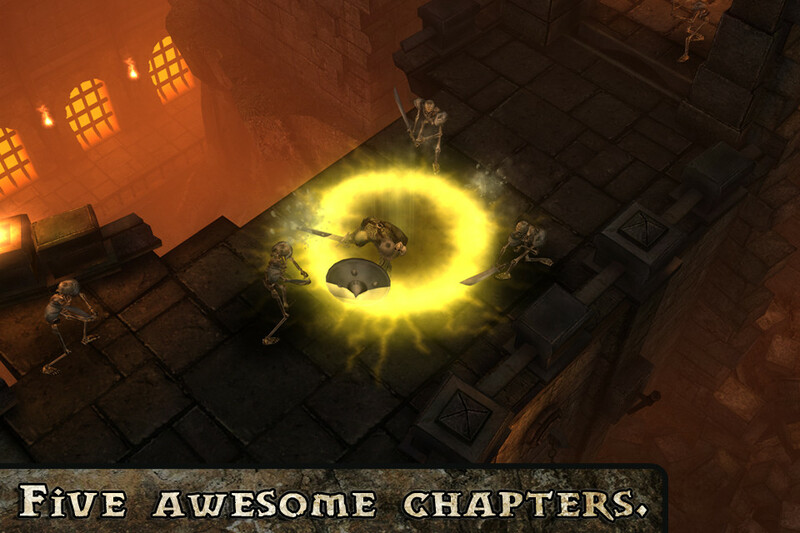 What makes a good RPG / Dungeon Crawler? If you were to ask someone like myself, who almost never plays them, it would be one that appeals to the masses in its gameplay encompassing something for everyone, not being to in depth to understand what the heck is going on, and having an even level progression and gripping storyline. 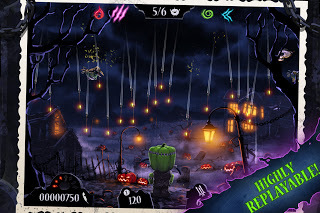 Orc: Vengeance, Chillingo’s latest fledgling entry to these adventures, is something that caught my eye from its initial release, and even being somewhat adverse to the genre, I thought I would give it a go. Mind you, the last time I dug into a similar title was Aralon: Sword and Shadow. I am certainly glad that I hit that Buy and Install button! The story of Orc is actually a worthy one, even with other reviews saying that it may fall into the cliche category, with you taking on the guise of an Orc Warchief, Rok, who’s homeland clan, Argon, is threatened by the ever flourishing ‘Dark One’. Your objective is to take on said damnable force and breach their stronghold head on, and put an end to this evil that was actually brought on by the now mortified humans. There are a variety of cutscenes that tell the story, but the more interesting way the chronicle is told is via strewn about books that you find similar to loot. The graphics are gorgeous. The animations are top notch, and the backgrounds are all exquisitely detailed. The framerate never suffers, and I can definitely say this is one of the prettier games I have had the pleasure of playing while maintaining such a great framerate. The loot system is downright perfect, with the enthusiast never feeling the urge to even glance at the all to existent and optional IAP system. 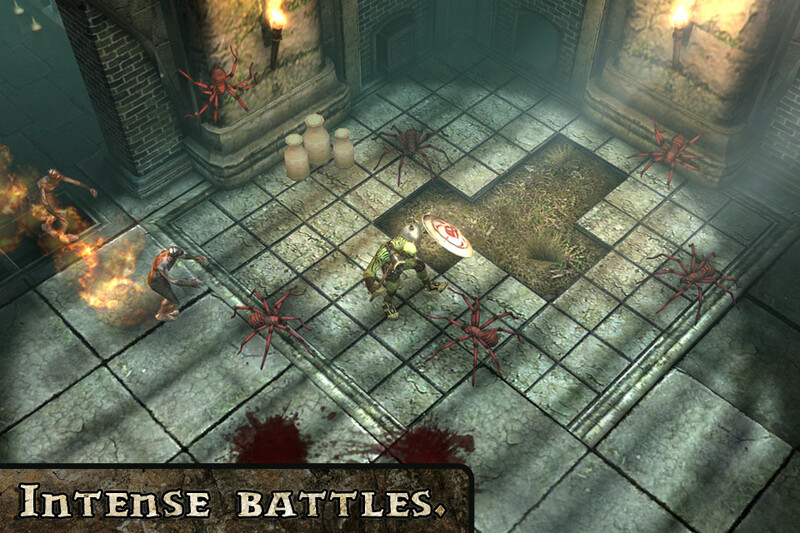 Each enemy you destroy drops some coins, and there are also treasure chests impeccably placed around each level. Another way to earn loot is to pick up dropped weapons from your defeated enemies, and sell them to the vendor whom you are prompted to visit upon each level completion. You can also hit the main menu at anytime, go to the vendor, and select the level you were on and you’ll be returned to the last checkpoint. 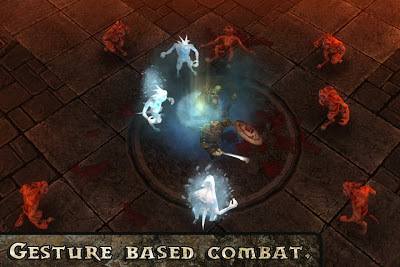 The weapons and shields have the typical attributes such as speed, opposing weapon upgrade capabilities, and defense powers. The weapons are all fun and unique, and I personally thought that having the biggest, baddest weapon was the best and didn’t care that it was the slowest. Their are limited inventory slots to use, which may be a put off to some, but I found the ones available to be plenty. The leveling system is standard fare as well; attack, defense, greed (ie. coin % earned), and vengeance. Vengeance is a key component to your combat as it is limited in supply, although is replenished over time, and is what is drained when doing your advanced combat ‘Skill’ moves. These skills are found in chests, so it is key to explore, something I found pleasure in and I think adds to the game. You can upgrade all of the skills, everything from the blizzard slam attack to the replenish health points, and this is based on your character’s current level. The combat is awesome. The interface is made up of a tap to move system, and the combat/skills are similar in using swipes and other gestures. You are allowed up to four(4) inventory gestures; I used two combat skills, and two for health/vengeance upgrades. Some may question the use of the touch to move interface as opposed to a joypad, but I can confirm that it works fine. The adversaries will certainly gang up and smother you if you don’t keep moving, which really add to the urgency of the combat scenes. The adventure has a great sense of pacing in that you will have an insanely intense battle scene, a perfectly placed checkpoint, and then you will be allowed to explore for a while to loot and upgrade etc. I found great pleasure in not having to battle back to back, well, not until the final few chapters anyway, but that’s to be expected when you’re getting close to your villain. If there is one fault of Orc, is that the foray went by all too quickly with the entire game taking me roughly 4-5 hours. I certainly think that the money spent was entirely worth it however. 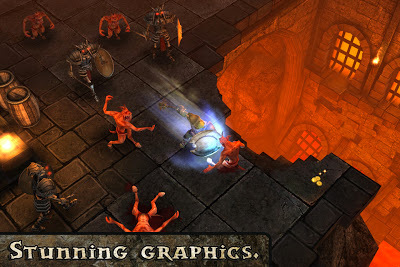 Those looking for an all around dungeon crawler with amazing retina visuals, fast paced combat, and great albeit not too in depth character and weapon leveling up systems will find a great time with Orc and I highly recomend it to those new to the genre, as well as to the seasoned Hack n Slash veterans. 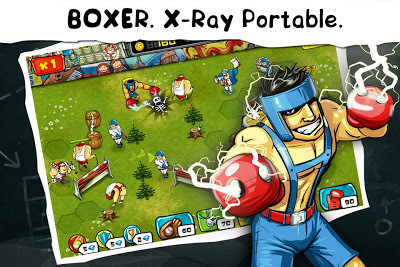 Shucks; another skier got through my gauntlet of baseball players, bowlers, cheerleaders, and x-ray wielding boxers. Sounds crazy fun, and it is! 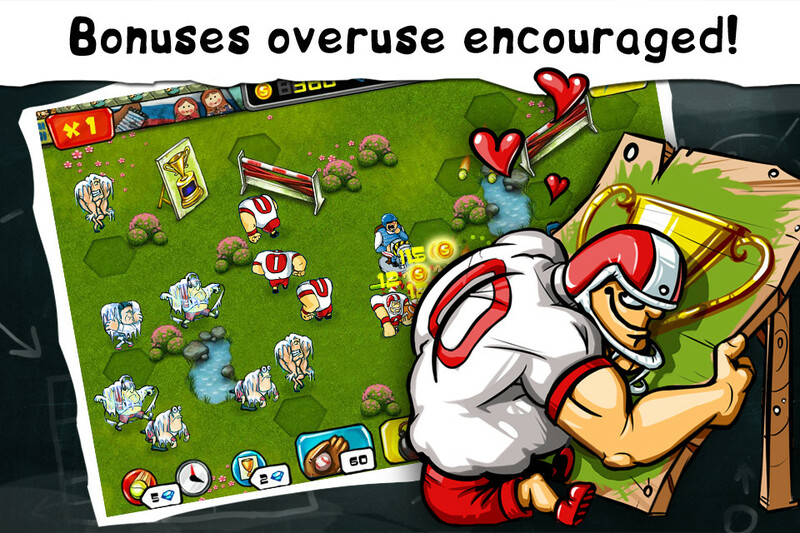 Goal Defense by Dyanmic Pixels is a new sports-themed Tower Defense title, that has loads of charm and all the challenge you could ever thirst. The environment has a light-hearted and fun-loving cartoon atmosphere that provides you with a feeling that ‘this shouldn’t be as hard as this’; but it is. Goal Defense is not unlike other TD’s as the primary goal is to safeguard your ‘bowl’, but Dynamic Pixels is certainly the first to come up with the idea that centers around your fortifications on the sports field. The contest starts out dispensing you with a baseball player and ‘Hummer Thrower’ that you strategically, and I mean precision-ally strategically, place on the field to battle the onslaught of jump-roping jocks, football players, and other silly oppositions. The key flavor of this adventure is that the ‘tower/player’ locations are not pre-determined, and one placement can highly alter the rival’s intended route.The animations are downright hilarious; the Hummer thrower for one likes to eat a lot, and the cheerleader seems to drop her pom-poms all the time. 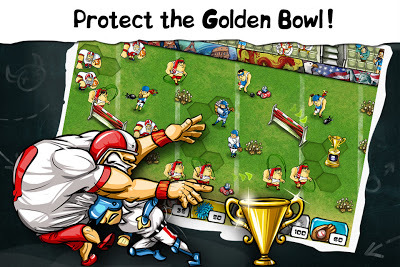 Problem is, I often got sidetracked in such amusements and before I knew it, I had the foolhardy enemy’s players breathing down on the coveted bowl. The sound effects are fun as well with the cheerleaders chanting you along, and the sound of baseballs beaming your competitors. You are allotted on average ten(10) players to reach your grail, at which point the level is over. The first few levels are great warm-ups for what is to come, but after that, this game means business. There are obstacles strewn across the field, some that look like equestrian hurdles, that you must use to your advantage to slow down the skiers, yes skiers, as well as foxy cheerleaders that will make any opponent slow down and gawk, allowing your baseball players and bowlers to pummel them when they are at their weakest. My favorite eccentric has to be the x-ray boxer who starts out with a simple one-two KO punch, but upon a few upgrades, draws his power from the almighty lightning gods and shocks the heck out of your rivals. You’ll just have to play it to understand, but it’s awesomely witty and hysterical. 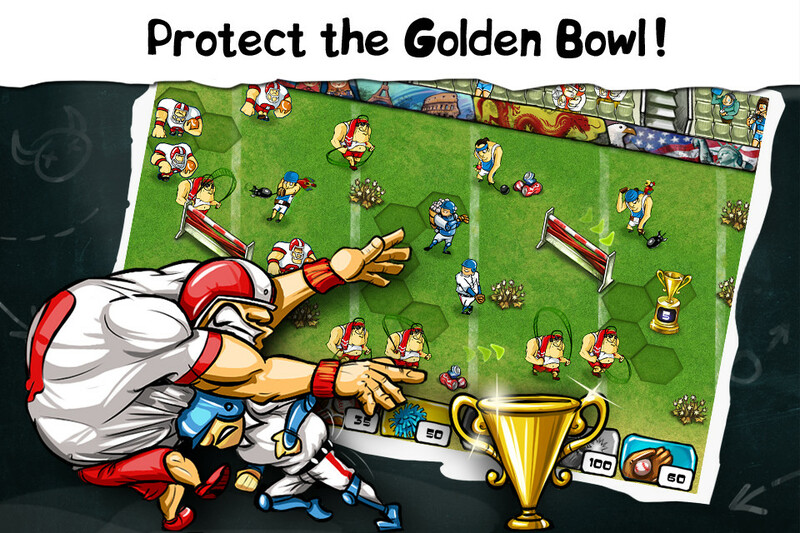 The customary upgrade system exists, and is imperative to stand a chance at keeping your bowl intact, let alone passing the level. Currently, there are four worlds, 40 levels, including each world ending with a jocular, albeit difficult boss battle. Considering the bullet hard difficulty (in a good way!) you may find yourself replaying levels to figure out your best placements, such as how to reroute the skiers to slow them down, and where its best to place your batters in line with your pitchers to maximize effectiveness. 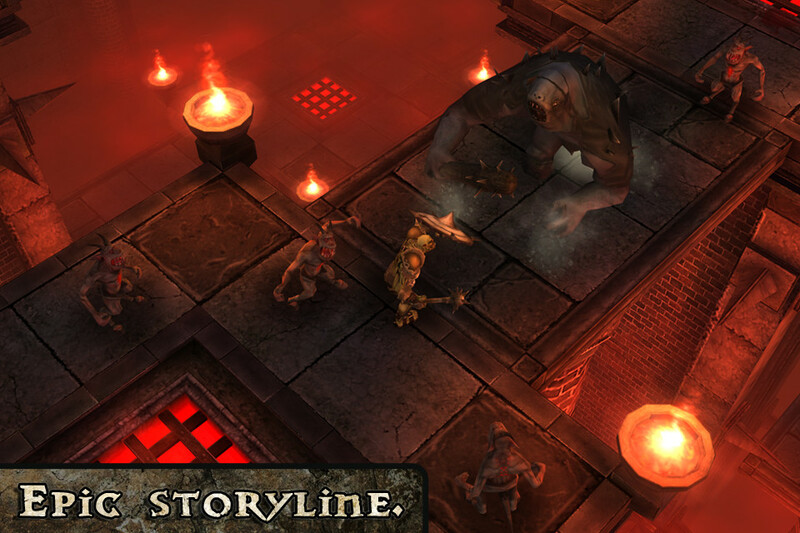 The whole game seeps with allure, and you’ll be captivated from the get-go. The in-game currency is in the form of ‘crystals’ which are rewarded based on effectiveness, wins, and other enticing factors. There is an IAP system as well, and unless you are incredibly adapt at TD’s, and if you want to keep your bowl un-violated, this is a viable option. Also of note, is that you start out with only a few different players, but the others are unlocked as you progress; this is all detailed in the shop via a simple click on the respective sportsman to see when they will automatically appear for usage. The sportsman and power-ups are available to be unlocked earlier so you desire as well, but I found it quite fun learning each athlete over a few levels and figuring out their ranges etc. 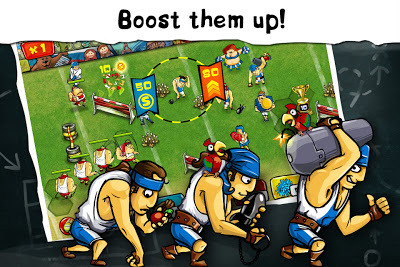 The power-ups are also unique; rain down a barrage of tennis balls on your foes, throw up a ‘false bowl’ temporarily drawing the enemies to itself, and a bowl ‘mine’ where you can set up explosives to guard it from a limited number of adversaries. I have been having a ton of fun with Goal Defense, and considering the freedom of placements, it really gives you a great feeling of accomplishment when you finish those super tough levels. Being Universal, and only a measly .99, it is hard to not recommend this all-around lively Tower Defense title. You will instantly tell the developers had a blast creating this, and right thereafter, you’ll have even more fun playing it. Just keep your eyes on the enemies, not those foxy cheerleaders, and try not to laugh at the animations as you’ll get carried away and have to start over! Well, that’s not a bad thing. High score chasers are always a huge hit or miss venture with me. When I saw Shoot the Zombirds come out in May of this year, I never thought it would be the type of game that would remain on my iPad for as long as it has. If you have played Infinite Dreams’ previous title, Shoot the Birds, you were probably inclined to pass this one by as, for me, it was not one that really embraced that gaming nerve that we all love to caress. Not so for me with Shoot the Zombirds as something about it looked interesting, I thought I would give it a try, and have been gratified ever since. Like its predecessor, Shoot the Zombirds has you controlling a pumpkin-man type entity whose sole purpose is flinging arrows at pum-kid (you see what they did there!) 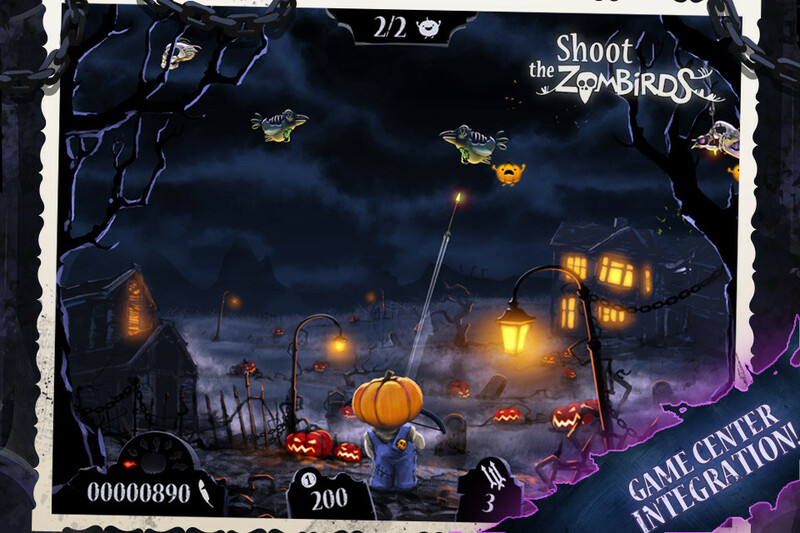 stealing Zombirds with his trusted bow and arrow. The mechanic is pretty simple, pull back anywhere on the screen, aim, and let er’ rip. The environment is top-notch and set against a Tim-Burton-esque blood-soaked haunted house/graveyard; probably the pumpkin man’s sanctuary. 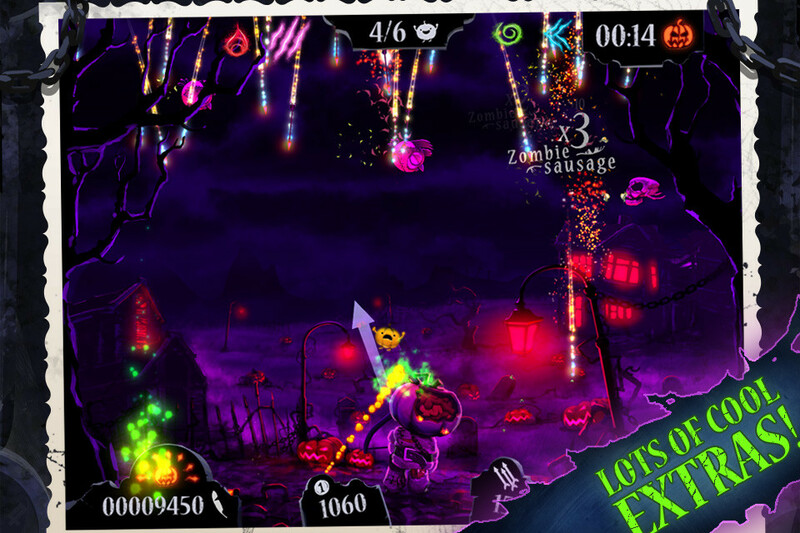 It sounds simple, and it is, but the game becomes quite addictive with enticing Game Center achievements, tantalizing Grave Store power-ups and clothing, and just plain regalement when you ‘Sausage’ two to three Zombirds on your armaments. It can get pretty addictive when acknowledging all of these factors. 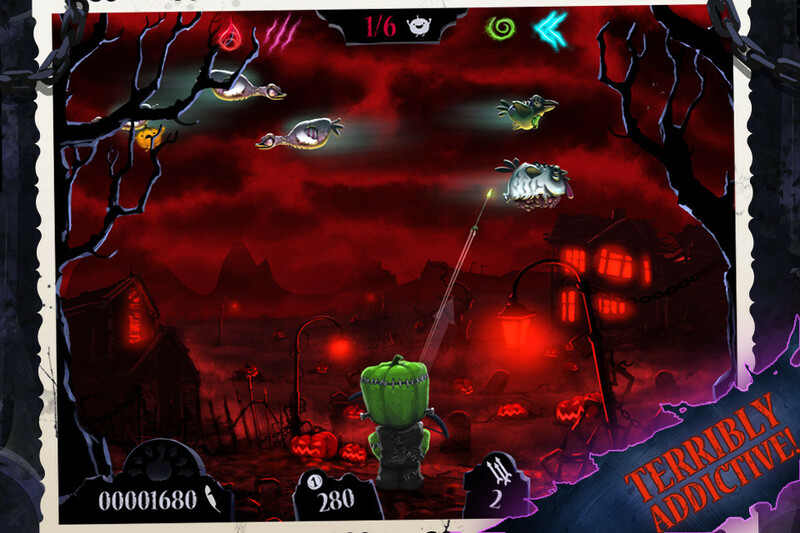 The Zombirds vary quite extensively from fat, big, and slow to small and very quick. And the small suckers don’t show up several waves in, as you will have to be combating with them as early as the second wave. And yep, they are pretty tough to hit. 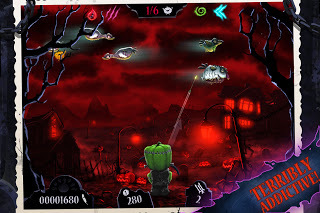 The Zombirds make one initial pass and let them fly by, they are going to kidnap one of your pum-kids. You are only allotted a certain amount of pum-kids, another Grave-store item upgrade as well, so taking out any of the fowl with your kin is certainly your primary objective. The participant is also only provided with a certain amount of arrows; the only way you can retain or increase your quiver is to make those shots! The Grave store items are super cool with power ups like ‘Rain of Pain’ where you can summon a swarm of target-seeking day-saving burning arrows, and the ‘Quiver of Plenty’ where you get infinite arrows for a certain amount of time. 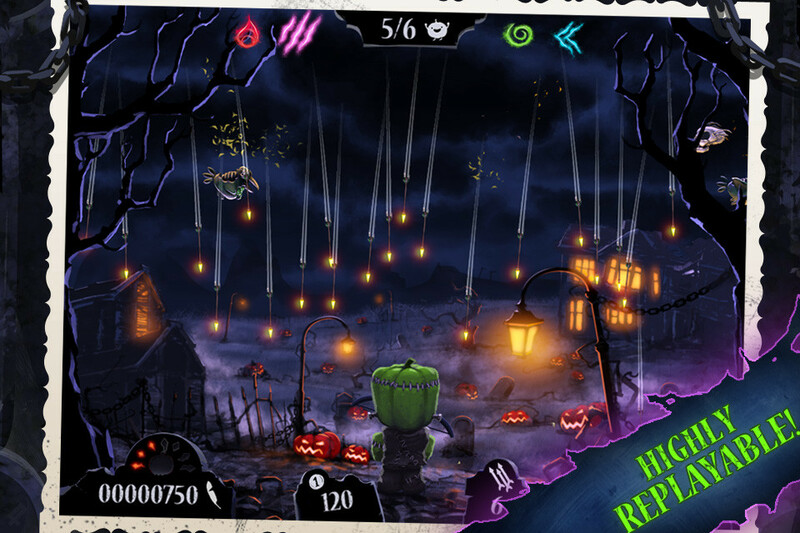 Coins are gained via achievements and by shooting these little skulls that traverse the screen from right to left. Power-ups exist to increase their frequency as well. The GC achievements are really well integrated to bait the user to that ‘one more round’ feeling. There is the standard IAP, but I have never remotely felt pulled in that somewhat adverse direction. 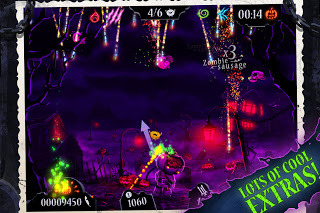 If you are looking for a casual pick up and play, laugh out loud a little, make some Game Center achievements score chaser, you may just find what you want in Shoot The Zombirds. It really triumphs in what it sets out to do, and it reminds me alot of something like Temple Run as far as it’s addictive qualities, and for its’ shear pick up and play nature.